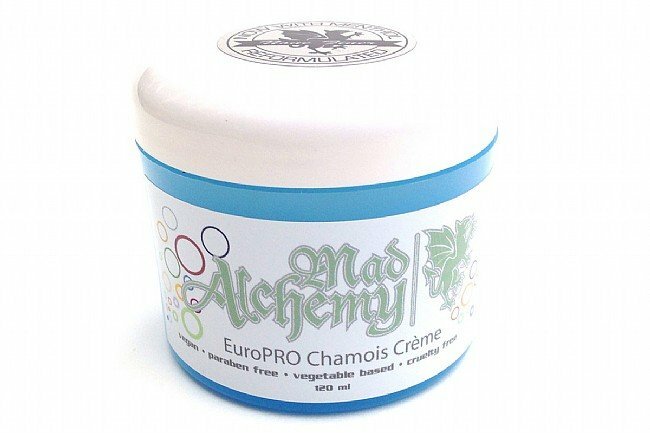 Mad Alchemy's Euro Pro Chamois Cream is made from all-natural, plant-based ingredients to provide superior protection from chafing and irritation, and the addition of menthol provides a subtle yet soothing feel upon application. Whether applied to a chamois or directly on the skin, Euro Pro Chamois isn't gloopy like other brands, and the incorporation of essential oils gives it a pleasant herbal scent. 120 ml jar. Vegan and petroleum-free. Not tested on animals. Im not a big chamois cream lover, but I thought Id give this a shot. Pleasant odor. Instantly heats up your nether regions, to a point I felt was uncomfortable. Its functionality was fine. I doubt I would buy it again, though I do appreciate the use of natural ingredients. Worked well on my last century run! I use this whenever I plan on 30 milers. Seems to do the trick.